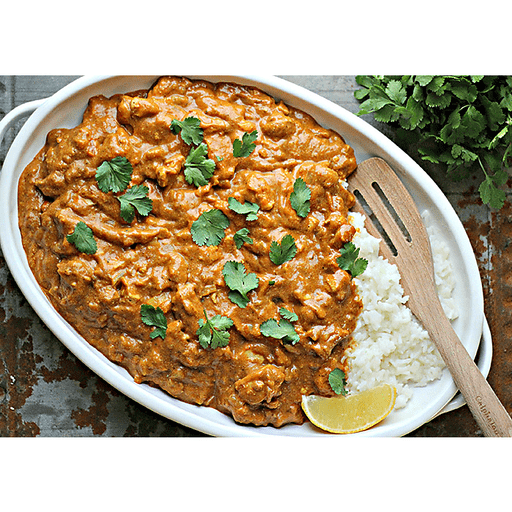 This Chicken Tikka Masala is packed with bold flavors. Don't be intimidated by the long ingredient list - this dish comes together easily! 1. Chop chicken thighs in to small, bite size pieces. Season with salt and pepper. 1. Whisk together yogurt, 1 Tbsp. canola oil, 2 Tbsp. lime juice and 2 Tbsp. garam masala in a bowl. Add the chicken and toss to coat. Cover bowl and refrigerate to marinate. 1. To make sauce, toast 1 Tbsp. garam masala, coriander, cumin, paprika, cardamom, turmeric and red pepper flakes in a dry Dutch oven for 30 seconds or until fragrant, stirring constantly. Remove and set aside in a small bowl. 1. Heat 2 Tbsp. oil in Dutch oven to medium-high heat. Add onion and allow to cook until soft, about 3-4 minutes. Add garlic and ginger and cook another 60 seconds, until fragrant. Add toasted spices and tomato paste and whisk to incorporate. Add chicken mixture and saute until chicken starts to cook, about 3-4 minutes. Stir in crushed tomatoes, coconut milk and ¼ cup chicken broth. Season with salt and pepper. Turn heat down to medium-low and allow to cook for 20-25 minutes, with the lid on, stirring occasionally. 1. Whisk together 2 Tbsp. cornstarch with remaining 2 Tbsp. chicken broth and stir in to the sauce and allow to cook on medium-high until sauce has thickened. 1. Stir in remaining lime juice. Taste and adjust seasonings, if necessary. 1. Serve with basmati rice and top with Greek yogurt, chopped almonds and cilantro for garnish. Calories 350, Total Fat 14g (Saturated 5g, Trans 0g), Cholesterol 80mg, Sodium 200mg, Total Carbohydrate 34g (Dietary Fiber 2g, Sugars 5g, Includes 0g Added Sugar), Protein 23g, Vitamin D 0%, Calcium 6%, Iron 15%, Potassium, 15% *Nutritional values are an approximation. Actual nutritional values may vary due to preparation techniques, variations related to suppliers, regional and seasonal differences, or rounding.